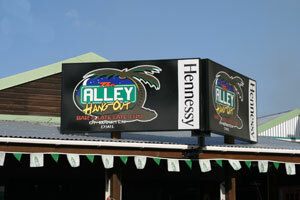 The Alley, known for its bi-weekly Latin Nights. You can find dozens of locals and visitors attending the Latin Nights on Wednesdays and Saturdays dancing, the night away. And The Alley is now offering its patrons dancing classes, so beginners can easily blend in. Whatever your skill and fitness level, whether you are bringing a partner or signing up individually, the salsa lessons at The Alley are for you. Dance teacher Nicolas Mayeko-Coklee from Salsa Vibes can turn any "two left feet" beginners into seasoned salseros or salseras. So put aside your schedule (or can't dance) concerns and try something that will give you more back than you ever expected! The salsa lessons are given in series of eight (every Wednesday from 9:00pm to 10:00pm), after which the group will move on to the next level. Classes are US $10 per class or US $70 for eight. All you have to do to start your salsa journey is to call Nicolas at 520-5624 or 526-8802, or pass by The Alley on Wednesday evening. Stay around after the lesson for the Latin Night and show off what you've learned!